There are no complaints about the quality of Brother SC9500. The price of this machine makes it unpopular to some extent. SC9500 is a computerized sewing and quilting machine. Not a lot of people have shown interest in this sewing machine, to be honest. This model is not a popular one for sure. If a machine is not popular, there has to be something missing, it may be the features or performance or the price. Let us have a close look at Brother SC9500. Brother SC9500 has a good number of built-in stitches, about 90 of them. To be honest, there are other Brother machines which offer 80 odd extra stitches than this one for exactly the same price. Now we are getting somewhere, lack of features and over pricing may be the reason why it got sidelined. The 90 built-in stitches of SC9500 include decorative stitches, heirloom stitches and 8 one-step buttonhole stitches. It also includes one built-in sewing font and 55 alphanumeric stitches. Brother SC9500 has a backlit LCD screen for stitch selection and adjustments. Speed control slider and start/stop button for sewing makes it a complete computerized sewing machine. These features lets you sew without using the foot pedal. The automatic needle threader and top drop-in bobbin are huge time savers. Reverse stitch button lets you lock the stitch at the beginning and end. The thread tension needs to be adjusted manually. The maximum stitch width can be set up to 7mm and length up to 5mm. The needle up/down button is another feature that is essential for quilters. Brother SC9500’s motor can deliver 850 stitches/minute, which is pretty much the standard for sewing machines in the price range. The machine has an option to adjust the presser foot pressure. SC9500 has drop feed for free motion quilting. But you will have to buy the free motion quilting foot separately. There are some useful quilting stitches on this machine. Quilting feet comes included in the box. The machine is free arm capable as well. A huge bonus is the oversized wide table which is very useful for large projects. Accessory storage space is built-in and included are the Buttonhole foot, Button sewing foot, Overcasting foot, Zipper foot, Monogramming foot, Blind stitch foot and Quilting foot. You will also get a decent number of other accessories as well. The machine is very light in weight, it weighs just 9.9 lbs. It has to be one of the lightest beginners machine around. Brother SC9500 comes with 25 year limited warranty cover. One noticeable thing about Brother SC9500 is that it is very easy to thread. The user manual does a very good job at explaining everything in detail. It is one of the quietest machine around. The machine does an equally good job with multiple layers and single layer of fabrics. It worked quite well on 4 layers of upholstery, so it must hold up good on heavy fabrics. The stitch quality on this machine is nice and consistent. The decorative stitches look quite good. The machine is very easy to use for beginners. The machine even tells you which foot to use for a particular stitch. The LED bulb lights up the working space quite well. Even though Brother SC9500 comes with sewing lettering font, it is not a real monogramming machine. Yes, you can sew a whole word or sentence if you want, but you have no options to change the shape or size. The letters are a little bit smaller in size for my liking. 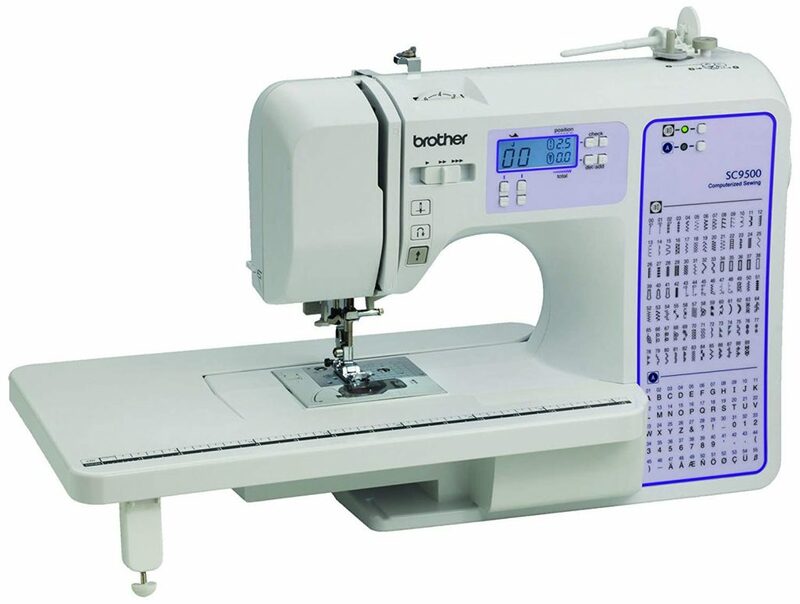 Brother SC9500 is a nice beginners sewing machine with good features, but its biggest bummer seems to be the price. For the features on-board, a small price tag would have been reasonable, but with the current price, there is too much competition from other Brother machines itself. All the alternative machines are right up there among the best performing sewing machines in U.S. The alternative models you can check out are Brother DZ2400 and Brother Laura Ashley CX155LA. Both come under the same price category as SC9500 and both have much more advanced features. DZ2400 has 185 built-in stitches, whereas Laura Ashley machine comes with 155 built-in stitches. In features, Brother DZ2400 is slightly more advanced than Laura Ashley machine with additional 30 odd extra stitches and stuffs. These two are high performance machines and you will never complain about their quality. When you compare the features of these two machines with SC9500, there is a huge difference. This difference made it unpopular, a lower price tag must do the trick.